"The desert of the Chartreuse is wholly inaccessible but by one exceedingly narrow defile. This pass, which is only a few feet wide, is indeed truly tremendous. It winds between stupendous granite rocks which overhang above; and appear ready every moment to fall with a dreadful crash, and overwhelm the awe-struck traveller. Indeed, the crags above project so far beyond the perpendicular; that they appear literally suspended without support." The Massif de la Chartreuse is an elongated mountain block some 45 kilometres long by 25 kilometres wide, situated between Chambéry to the north, and Grenoble to the south. The east flank falls abruptly almost 2,000 metres to the Isère valley, whilst to the west, the high ground falls away towards the Rhône valley. It is separated from the Vercors upland area to the south also by the Isère river, which swings round to the west at Grenoble on its way to the Rhône (regional map). The high summits and ridges reach a little over 2,000 metres, whilst the main internal valleys lie at around 1,000 metres (see a Digital Elevation Model of the area). The basic lithology of the region is relatively simple. The lower and outer slopes are formed of limestones from the Jurassic period, yellow and relatively soft. Above these lie Cretaceous Hauterivian marls, consisting of a hundred metres of so of black shale. The highest rocks of the area, which give the region its appeal to walkers, climbers, and cavers alike, are the massively bedded Cretaceous Berrèmian limestones which are some 450 metres thick but appear much thicker as the result of geological structures within the area. These were laid down as shallow marine carbonate platforms on the northern flanks of the Tethys Ocean when sea levels were some 250 m higher than they are today, at the same time that chalk was being deposited in deeper waters over northern Europe. Rudist bivalves are the commonest fossil to be found in these limestones. The region is part of a textbook example of an orogenic belt outer zone. It was elevated during the Alpine Orogeny, which was the result of the Italian microplate colliding with the European plate, some 45 million years ago. The resultant pressure from the south-east caused massive thrusting and folding which has been a major influence on the structure of the regional topography. The Massif is divided by a long, deep internal valley running from the col de Porte in the south, to the col du Granier to the north. This valley is sub-divided between the two major villages St. Pierre de Chartreuse to the south, and St. Pierre d'Entremont to the north, by the col du Cucheron. The two basins thus formed drain westward from the two valleys through the impressive gorges of the Guiers Mort in the south and the Guiers Vif in the north. Above the internal valley, are a series of anticlinal ridges enclosing synclinal valleys which dip down to the north and west, sometimes ending abruptly in impressive limestone cirques overlooking the central valley. These include the Cirque de St. Même near St. Pierre d'Entremont, and one at the head of the Perquelin valley near St. Pierre de Chartreuse. There are a number of distinct summits which stand out from the ridges. The principal ones are the three peaks of St. Pierre de Chartreuse - Chamechaude, the Grand Som, and Dent de Crolles, which looks particularly impressive from the Isère valley, and there is also Mont Granier which looms over Chambéry in the north. Another set of impressive geological features that facilitate access to the tops are the series of south-west north-east strike-slip faults that segment the massif. Thus, for example, the l'Alpe is separated from its neighbours Mont Granier and l'Aup du Seuil by two such faults, both of which are followed by important transhumance routes. The climate is what one would expect in the pre-Alps. Although precipitation is spread fairly evenly throughout the year, the highest precipitation months are from September to December, with snow dominating from December to March. The driest and warmest summer months are July and August. 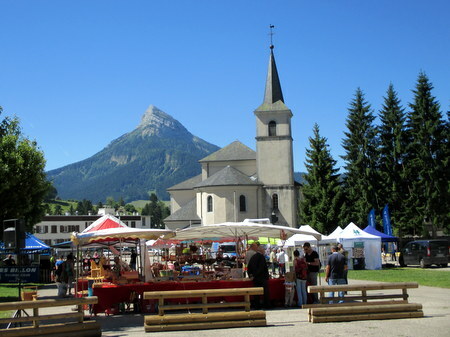 Apart from the two St. Pierre's, the internal valleys are dotted with small rural communities. The vernacular architecture is distinctive - houses are square, with the walls constructed of semi-dressed limestone with massive dressed coins, and the roofs hipped, tiled and slope steeply, usually with skylights ventilating the roof space. The roof ridge is often decorated with zinc ornamentation. Barns tend to have a base of stone with wooden upper walls, and steep wooden roofs often shingle clad. The main industries are pastoral farming, with herds of the beautiful native tarine (also known as tarentaise) dairy cows, sheep and goats grazing the high alps, sustainable forestry and tourism. The latter does include skiing but, thankfully, the development has not been overly intrusive, and with the exception of poor Chamechaude, has been kept away from the main walking areas. Vineyards of the AOC Savoie wines may be found on the north-east slopes of the massif, particularly around the villages of Abymes and Apremont. A variety of grapes are grown, including the local Jacquère used for white wine, and Mondeuse used for red. Gamay is also extensively grown. Above the pastoral valleys, forested slopes rise up steeply towards steep cliffs. Above these may be found a hidden world of high altitude plateaux and valleys, vegetated with grassland and dwarf forest.